Oh the journey we’ve traveled from teaching to creating children’s books! When we started the journey to writing children’s books in 2013, we didn’t have a clue what we were doing. Teaching Marine Biology to high schoolers and elementary kids had us wishfully dreaming to reach even more kids with the message of wonder for our oceans. We aspired to hook kids on the awesomeness of the ocean at a young age and inspire more to feel the close connection to our oceans, whether we live near the coast or inland. So, we drew out some sketches, brainstormed some story ideas, and experimented with paints. The whole thing was an adventure. An experiment. And finally, we came out with our first book, Zale’s Tales: The Quest for the Magic Pearl. And we were hooked! We loved creating it so much that we couldn’t wait to get started on our second book. And then our third…fourth…fifth. As we created more and more, we started to look back on the first one…and got the itch to re-do the artwork! We had grown more in our style and learned a lot as we went, and so the first book wasn’t quite up to what we had grown to. So, we took on the task of re-doing the artwork for EACH and EVERY page! And what a joy to revisit our first story, bringing it to life in a way that reflects how far we’ve come. We made new drawings and painted to our heart’s delight. It wasn’t easy: some of the pages took days, even weeks to complete. But it was a labor of love that we are truly proud of! We hope that it inspires kids all over the world with a love for our oceans. So, without further ado, we’re giving you an exclusive look into our new artwork of Zale’s Tales: The Quest for the Magic Pearl with a look at the before-and-afters! And finally, we’ve even added a spread that has info about each ocean animal in the book. Woot woot! One moonlit, magical night changes everything for a young boy named Zale. On this night, Zale finds a beautiful, violet pearl that sweeps him away into the ocean blue – as a sailfish! Gone were his arms, legs, and toes. No more were his ears, hands, and nose as he raced through the water with his powerful tail, fins, and majestic sail. When the magic pearl slips from his grasp, Zale transforms into ocean animals of all kinds to not only find his prized pearl, but his way home. From the sandy shallows to seaweed forests to the dark deep sea, join Zale as he explores the mysteries of the ocean and searches for his lost, magical pearl! 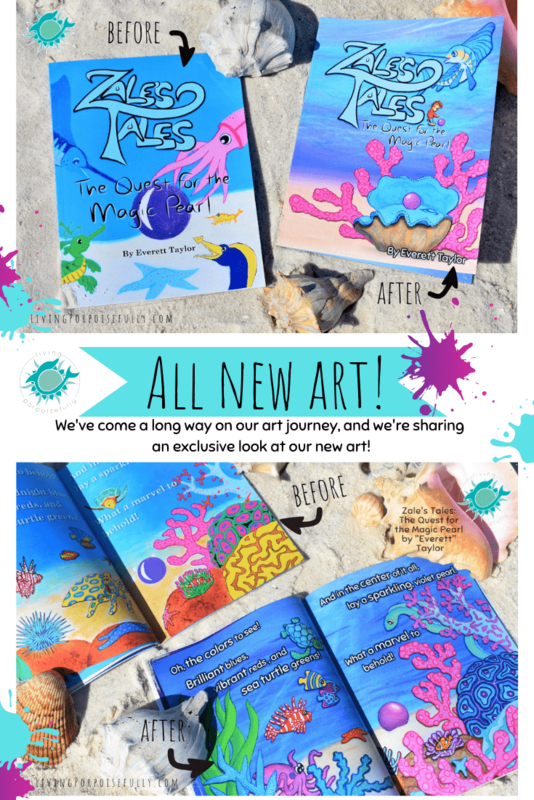 It’s jam-packed with ocean creatures of all kinds and is perfect for inspiring ocean love for all the kiddos in your life! Check it out on Amazon.com and share the message of ocean wonder and appreciation! Of course, stay tuned — we’ve got lots more books and activities that we plan to add to the collection! Wow guys this looks amazing! So glad you have updated just in time for my new Grandson!!!!!! You know the first gift will be a set of your wonderful books.